Gently scrub potatoes with a vegetable brush under cool running water. Most nutrients are preserved when potatoes are cooked and eaten with the skin on. If peeling, use a vegetable peeler or sharp paring knife and keep the peeling very thin, since many of the nutrients are found close to the skin. Sometimes potatoes that are cut and uncooked take on a pinkish or brownish discoloration. It’s due to the carbohydrate in the food reacting with oxygen in the air. Potatoes that become discoloured are safe to eat and do not need to be thrown out. The colour usually disappears with cooking. Preserve the color of cut potatoes by storing them in cold water, and add lemon juice or a little vinegar. Limit water soaking to two hours to retain water-soluble vitamins. There is a unique and special dish for every occasion. Just visit our recipe pages to find the potato dish suited for your needs. 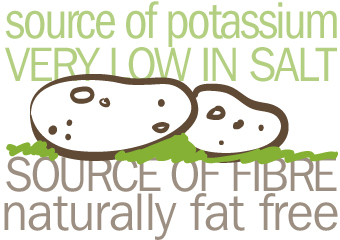 Keep in mind, to preserve the abundance of nutrients in your potato, cook them in their skins. Steam or microwave your potatoes, instead of boiling, as water naturally leaches some of the nutrients from food cooked in it. If you do boil, consider using that water to moisten your mashed potatoes or in soup. Refrigerate any leftovers within two hours of serving to prevent food-borne illnesses. Any meal leftovers should be consumed within a few days. We don’t recommend freezing cooked potatoes at home as they become watery upon reheating. The potato is 80 percent water; and when frozen, this water separates from the starch and nutrients.